Another new year has started, and unlike most new years in my life, I feel no desire to set any goals. 2017 started this trend. That was the first year when I didn’t set any goals. None. It was a very hard year. All I could do was get up, shower, and get through the day. I had to let setting goals go and I’m glad I did. Then, in 2018, I set habits instead of goals. Here they are. I’m happy to report that I integrated most of these habits into my daily life, but I didn’t do #2 and #4 as much as I would have liked. There were days when I wouldn’t create at all–no writing, no drawing, no notes, nothing. Some days it was because I was avoiding it and procrastinating, and some days it was because I simply didn’t feel like it. I tried to not beat myself up about it. There were also days when I didn’t exercise. Not for 20 minutes. Not even for 10 minutes. It wasn’t good for me and I could feel it in my body. Again, I tried to not beat myself up over it. Now, it’s 2019, and what I’ve realized is that I’d stop beating myself up over reaching or not reaching goals if I didn’t have them at all. It feels liberating to write that. I do have desires though. Two of them. The first is to keep doing things that feel good. The second is to stop doing things that don’t feel good. Something about the word ‘desire’ feels more welcoming to me than ‘goals.’ In fact, the word ‘goal’ brings up a strange feeling in me now. For most of my life goals used to make me excited. Now, the thought of them turns me off. It makes me heave a sigh and think, “Not goals again!” It makes me turn to my stuffed calico cat, give her a hug, and whisper, “Don’t people know that goals aren’t the way?” More on that in future posts, but suffice it to say, goals just don’t float my boat any more. Does that mean I’m going to lounge on my couch and gaze at the beautiful trees and mountains all day? Well, yes, but that’s not all. I’m going to go about each day in 2019 doing the things and habits that feel good (or that make me feel good after I do them). When something doesn’t feel good, I’m going to listen (instead of ignoring or rationalizing or thinking it away)…and stop doing it. It sounds so simple but it’s harder than you think. So, off I go into the new year with two desires at the core of my being: keep doing things that feel good and stop doing things that don’t. That’s it. I’ll let you know how it goes. What about you? I’m curious what you think. Would you do me a favor and answer just two questions in the comment box below? Do you set goals at the start of a new year? Why or why not? Please comment and tell me what you think. I’d love to hear from you! I’m not a religious person. I consider myself a spiritual person, but religious? No. In fact, one of the things I’m most grateful for from my childhood is that my parents raised me without religion. They already tried to rule my life with an iron fist, and if religious dogma had been added to that, I don’t know if I would have survived. 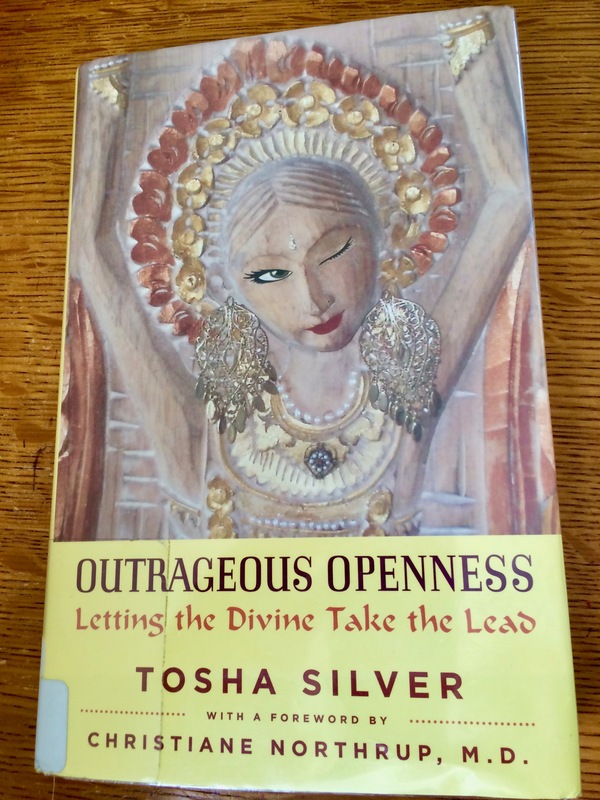 So, to my great surprise, I found myself relating on a deep level to a book called, Outrageous Openness: Letting the Divine Take the Lead by Tosha Silver. This book was recommended to me by my therapist during a recent session where I confessed that thinking about when and if I’ll ever get an agent, and when and if I’ll ever sell my novel, was causing me depression and anxiety. I remember her telling me at the end of our session that I might like this book. She mentioned that it was pretty out there and kinda “outrageous,” but why not give it a shot? A book about the Divine? Really? Outrageous Openness gave me answers to many questions I’ve had throughout my life. I could relate to it on so many levels. For example, although I’m not religious, I’ve always believed in God. But, I don’t see God as this old man or old woman in the sky. When Tosha described God as the Divine Spirit that’s inside of you, not some figure in the heavens, it made so much sense. I read two to three chapters a day–only two to six pages each time–so I could really draw out and enjoy this book. It was the right pace. I was able to digest its contents and start putting Tosha’s tips to use right away. One key tip was to take action toward what you want, but stop focusing on outcomes. This is something I’ve been struggling with since I started writing full-time. My goals haven’t felt right, sometimes even a day after I make them. I think it’s because I’m too focused on reaching a particular outcome. For almost three years, I haven’t met my goals in the time that I set for them, and many I’ve simply discarded. But when I’ve let go of goals and outcomes, I’ve been able to move forward and accomplish things that I wanted to do (and some I didn’t know I wanted to do). I’m now letting the Divine take the lead. I still take action, but I’m trying to not focus on outcomes. I do what feels right. If it doesn’t feel right, I don’t do it. It takes practice. I’m finally trusting my inner Divine and it’s changed everything. A thousand thank you’s, Tosha. Hope you’ll give Outrageous Openness a chance. Like my therapist warned, it’s pretty out there and outrageous. Then again, couldn’t we all use some outrageousness in our lives? I sent my SEVEN DUDES DOC AND THE SEVEN manuscript to my editor ten days ago. I dropboxed it to her in the morning, after working on it for 20 minutes (last-minute spellcheck, don’t you know?). The rest of the day, I was so tired I could barely move. 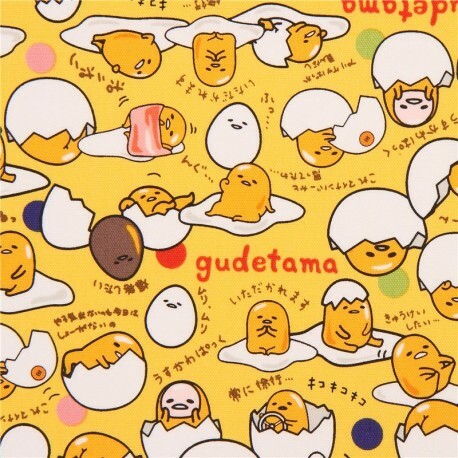 You know that super cute ‘lazy egg’ character by Sanrio called Gudetama? Well, that’s how I felt. Like Gudetama, I just wanted to lie down on my egg white mattress and pull a bacon blanket over myself. I got into my pajamas early (wasn’t I just wearing these?) and couldn’t do anything except lie around and watch Netflix. I thought I was getting sick again. I had just kicked a terrible, lasting cold a few weeks before but the cough still occasionally came back, so I thought that was it. It was just exhaustion from working on one thing for 26 months. How did I know it was this and not something else? Because the next day, I woke up with energy. I walked down to the farmer’s market with Marcus. Then, for the first time since it opened six years ago, I went to the Dakota Art Store in my neighborhood. I haven’t shopped for art supplies in years…decades! It was like coming home. Then, that night, as if perfectly planned as a reward for finishing my novel (but it wasn’t planned that way at all), Marcus and I went to see the awesome author Anne Lamott speak at Benaroya Hall. People often think that after achieving a big accomplishment, you should whoop and shout and kick up your heels and celebrate! I often think that. And, I often encourage my friends to do that when they finish something major. But, that’s not what I like to do. It’s taken me years to figure this out. After I achieve something major, I want to sit with that feeling for a while. Quietly. In this case, my body and mind had been slightly tense for so long (26 months!) while working on my novel, that it finally let go and all the energy was drained from me. Then, I got it back. But I still didn’t want to whoop it up and celebrate. No, I needed to slowly recover and recuperate after giving birth to my novel. Walking to the farmer’s market felt good. Shopping for art supplies felt good. Listening to the sensitive, funny, and very human Anne Lamott speak about getting older, mercy, grace, failure, and writing felt good. I thought that I’d dive right into my next writing project the very next day but that didn’t happen. I wasn’t exhausted anymore, but I didn’t feel excited about writing fiction. Really, the best reward for finishing my writing was to NOT write. So, that’s what I’ve been doing the last ten days. 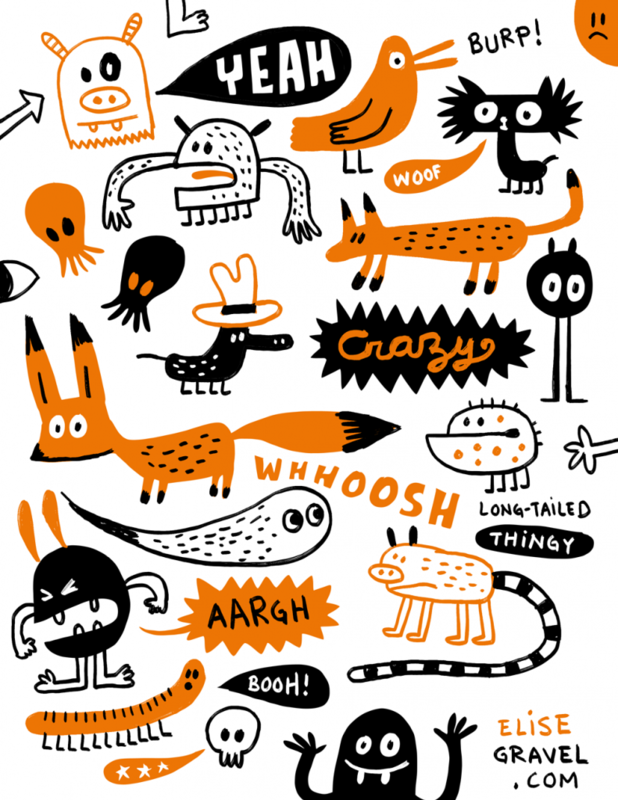 I’ve been drawing, redesigning my web site (how do you like it? ), filing my taxes, taking walks, shopping for new clothes, cleaning, decluttering the house, and more. But, I have not been writing. And I have to tell you, it sure feels good. Gudetama art square by Kawaii Fabric. #1: I stopped making goals, and started making habits. 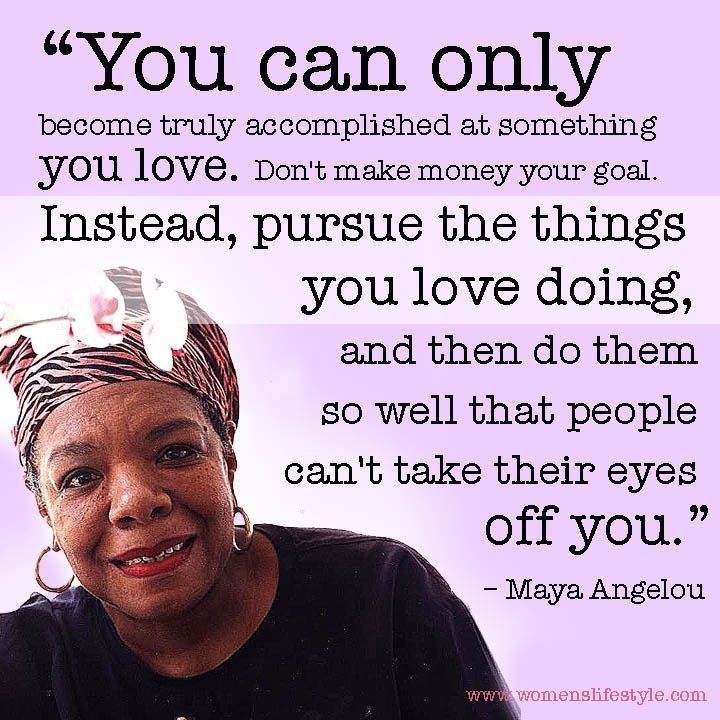 In the past, I’ve always made much bigger goals than I could ever achieve because I like reaching for the stars. But, this year, it felt wrong to do that. I was grieving, both personally and politically, and I just did not have the energy to make goals. Instead, I tried to establish good habits that would sustain me. That included trying to exercise every day, read for pleasure every day, practice self-care every day (like meditating for ten minutes), and write for at least 30 minutes every day. Over time, I got better at doing these habits, and felt a little bit better each day. My takeway? How you live your days is how you live your life. #2: I supported arts and artists. For me, one of the main things that makes life worth living is ART. So, this year, I put my money where my mouth is and supported artists and the arts. I went to see plays like The Odyssey (with 100+ actors!) by Public Works Seattle at the Seattle Rep, and Dragon Lady by the incomparable Sara Porkalob at the Intiman Theatre, and Howl’s Moving Castle at Book-It Theatre–all of which made me laugh, cry, and feel more alive. I saw hilarious comedians Ali Wong and Hari Kondabolu. I saw a mind-blowing remake of The Wiz by Seattle Parks and Recreation’s Teen Summer Musical. I bought lots of books, magazines, poetry, and zines. 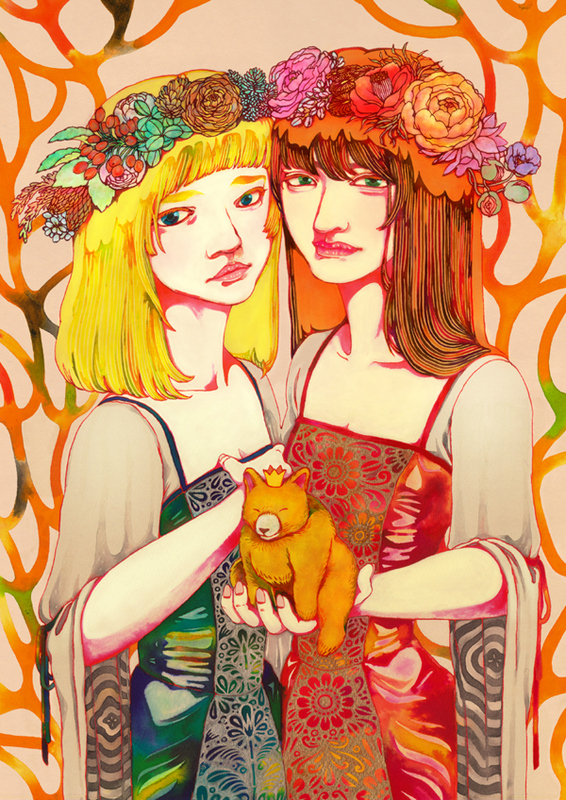 I went to Short Run Comix & Arts Festival at Seattle Center and Wordstock in Portland. All these things brought me joy. My takeway? Vote with your heart and your dollars. #3: I spent time with people I cared about. I know of 13 people who died this year, including my pop-in-law. Some were people I knew personally and others were the mothers, fathers, siblings, and friends of people I know. Death is a normal part of life, but nothing about it feels normal when it happens. All this death helped me to realize how important it is to spend time with people you care about, and, more importantly, to try to be present with people when you are together. My takeway? Enjoy time with loved ones while they’re still alive. #4: I supported social justice events and organizations I believed in. It’s hard to feel like you can make a difference when there’s so much going wrong in the world. But, every effort matters. Every step can lead to change. It’s like that quote by Margaret Mead: Never doubt that a small group of thoughtful, committed citizens can change the world; indeed, it’s the only thing that ever has. I reminded myself of all this when I marched in the Women’s March and the Black Lives Matter March; when I protested against Milo Y’s speech at the University of Washington; when I donated money to Planned Parenthood and University Beyond Bars; when I called my local politicians; and when I voted. My takeway? Vote with your voice, your feet, and your dollars. They all make a difference! #5: I limited the amount of news I consumed. I stopped reading our daily newspaper, and only read the articles that my husband Marcus recommended. I started reading headlines on Twitter, instead of reading more articles. If it was something I was really interested in, then I would read the article, but I was more discerning than in 2016. I stopped watching local and national news years ago, so I kept doing that. My takeaway? Protect your mind, because no one else will. I will continue doing these five things in the new year. They helped me through this hard year and I know they will help me again, whether 2018 is difficult or not. What about you? What things do you do to help yourself through a difficult time? Post your thoughts below. I’d love to hear from you!